A complex floral with fruity and spicy notes, Pheromone Midnight is a "statement" fragrance that speaks volumes about the woman who wears it. She works and plays by day, but when night falls and the stars come out, so too do her innermost longings for love and romance. Pheromone Midnight Body Lotion 8 oz. Ingredients: Water, Cetyl Alcohol, Glyceryl Stearate, Cetearyl Alcohol, Polysorbate 60, Fragrance, Mineral Oil, Methylparaben, DMDM Hydantoin, Symphytum Officinale (Comfrey) Extract, Chamomile (Anthemis Nobilis) Flower Extract, Arnica Montana Flower Extract. May Contain: Blue 1, Yellow 5, Yellow 6, Red 40, Red 33. I love spicy, oriental fragrances. Unfortunately, this gives me the worst headache. Reminds me of Opium and I have an entire unused bottle of that on my dresser that I can't wear either. It's a good value, nicely packaged and the scent lasts forever. The lotion is silky and the scent isn't as strong but I still get the headache. I would recommend it to someone who likes those scents like Opium or Obsession. Just not for me. Sending this back. Former model and beauty industry pioneer Marilyn Miglin understands the elegance of age, and wants to empower women to feel beautiful. For 40 years, Marilyn has been committed to researching the newest ingredients for advancements in skin care. 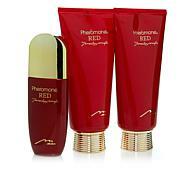 Her anti-aging skin care lines help add firmness, resilience and smoothness to menopausal skin. Try her enchanting fragrances, too, for an experience you won't soon forget! " Remind me about Marilyn Miglin upcoming shows.